Build a street diner with an American diner style jukebox, plus a boxing gym, recording studio and a host of fun celebrities and surprises! Stage a LEGO Marvel Super Heroes 76108 Sanctum Sanctorum Showdown between Iron Spider-Man, Iron Man and Doctor Strange and the super villains. This all-action super hero toy features a foldable, 3-level New York City building including Doctor Strangeâs Sanctum Sanctorum, with an exploding wall function and hidden Infinity Stone element, plus a pizzeria and Peter Parkerâs apartment, both with exploding window functions. The rooftop has a minifigure-launch function and a water tower with minifigure-winch function for Iron Spider-Man. 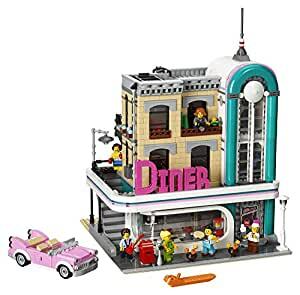 This buildable set also includes a detachable street corner scene, plus 4 minifigures and a big figure with weapons and 20 Power Burst elements. This is a fantastic LEGO set as part of the modular line series. Please note, the modular series LEGO sets are HUGE and really take a time commitment when building. The boxes are large and the completed LEGO build is quite impressive. This particular LEGO set took me around 6 hours to complete. It’s also worth noting… the instructional manual that comes with this set was easy to follow and helped with the building process… all 200 pages of it! 5 bags with #1, 5 bags with #2, 3 bags with #3, 4 bags with #4, and 3 bags with #5. You also should have received 4 medium size grey plates, a full size sand colored baseplate, and an instructional manual. – The gum ball machine and the juke box on the first floor are great. – The grill is a nice size and provides tons of room for cooking. – The set comes with 6 LEGO minifigs… the nice part of these minifigs is that this is the first modular series set where the minifigs have actual expressions on their faces. All the previous modular series LEGO sets have the classic LEGO face. This also means these minifigs will stand out when combined with the other modular series sets. – The patterned black and white floor on the first floor looks fantastic. – The punching bag and the boxing ring in the gym on the second floor are both very detailed. – The word ‘DINER’ looks great when finished. – The ‘audio’ room with sound absorbing material on the walls on the third floor is awesome. – There are NO stickers with this LEGO set… each piece that would require a sticker is printed (love this!). – The set comes with a sand colored baseplate… I honestly don’t know why LEGO chose this particular color… I ended up using a grey baseplate instead which I felt was more accurate unless you plan to put your Diner on the beachfront. – I wasn’t a big fan of the car because it didn’t really fit within my LEGO city… there’s really nothing wrong with the car as part of this set, however, if you want this set to be a part of a larger LEGO city scene, the car may not fit in. Overall, the modular series LEGO sets are great and you surely won’t be disappointed in this purchase. The truth is, the sets very rarely go on sale, so don’t shy away from the full price thinking it will go on sale soon. The only time these sets go on sale is usually right before they retire, which could be several years considering this set just came out. If you’re looking to get a few other LEGO modular series sets, I would recommend the following: LEGO Creator Expert 10243 Parisian Restaurant,LEGO Creator Expert Brick Bank 10251 Construction Set,LEGO Creator Expert ASSEMBLY Square 10255 Building Kit,LEGO Creator Expert Ferris Wheel 10247 Construction Set,LEGO Creator 10232 Palace Cinema. In closing, I give this set a strong BUY recommendation. The piece count is high and the build is very much so enjoyable. This could be a neat build to complete as a family or in isolation in your freetime. You’ve been warned… but once you get a LEGO modular set, you’ll never go back. They are addicting due to their level of detail and sheer size. If you found my review helpful, please let me know below. If you have any questions, don’t hesitate to ask. Awesome three story building. Rated for 16 year olds but instructions were perfect for my 11 year old grandson. So many details. Diner very reminiscent of grandmothers teen years!